We extend renewed thanks to Edward Bodenham, Marketing Director at Floris, who took time over a pot of tea and a dish of Welsh rarebit in Fortnums to speak with young Mrs Tweed on scents and (British) sensibility. Edward is a 9th-generation member of the Floris family. 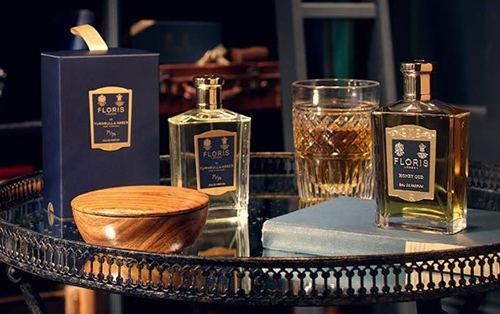 Floris is a small family business, so he is closely involved in the creation of new fragrances and other areas of the business, working alongside various branches of the close-knit Floris family. 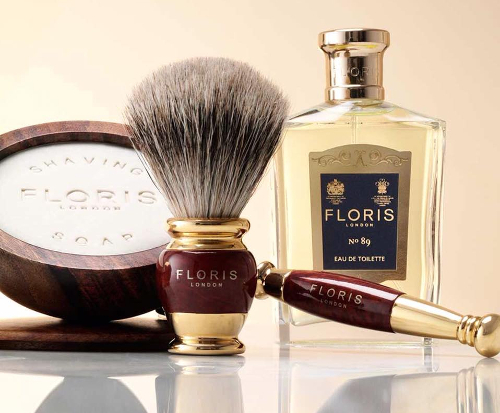 What is special about Floris products? 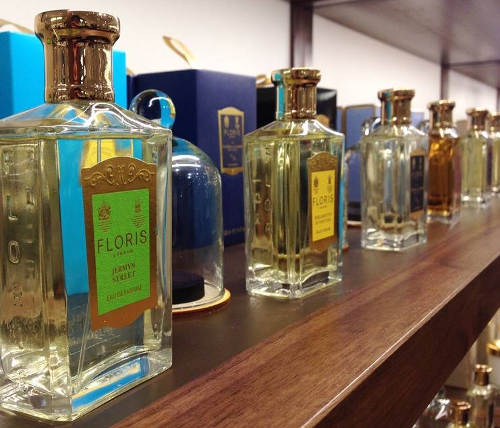 Floris is unique in being the longest running perfumery as far as we know anywhere in the world. We are still a family business and have never changed hands so are very fortunate to be able to have retained all the formula books and expertise passed down from over 280 years of creating fragrances. The fact that we are all direct family members working in the business means that we naturally have such a passion for the quality of our products, which I’m sure our customers recognise and appreciate. Where is Floris most popular? We are most popular in the UK, but have many customers all over the world. Our biggest export markets are currently Italy and Germany. What is Floris' best-selling male fragrance? Our best-selling male fragrance is No.89 which has recently overtaken Elite in popularity. It is a quintessentially English gentleman’s fragrance, clean with fresh citrus cologne top notes and a distinctive spicy woody character. How do you arrive at the names for the perfumes? Many of the names for our ladies fragrances, like Night Scented Jasmine are taken from the flower that features most prominently within the heart notes of the fragrance. 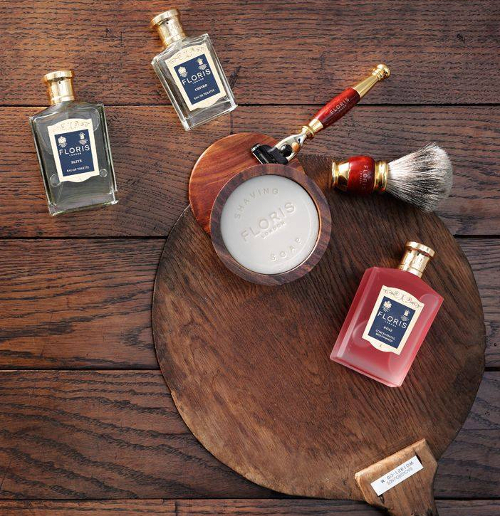 One of our men’s fragrances, called JF, is named after our founder Juan Floris. One of our most recent men’s fragrances, Mahon Leather, is named after the capital of Minorca, birthplace of Juan Floris. With Minorca under British possession, he sailed to London and married his English rose Elizabeth before setting up the shop at 89 Jermyn Street. Do you think preferences for particular scents have changed overtime? In the very early days of perfumery, fragrances tended to be much stronger and less sophisticated. This is due to the fact that not only did people not cleanse as often as they do now, but also only certain oils were able to be distilled. 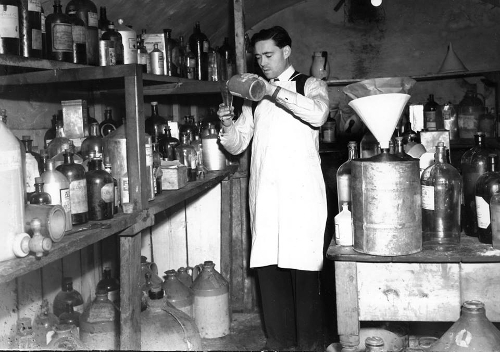 Now, due to much more advanced distillation techniques we are able to extract many more refined and subtle essences to use in the creation of a scent. Generally I think that preferences have changed to people wanting a fragrance that has many different nuances and represents an element of their personality in some way. More recently I think that there seems to be a trend to customers wanting to find a fragrance that is a little bit more special and individual and is not necessarily something that is the latest ‘big release’. How do you preserve your heritage but continue to innovate? Our heritage is incredibly important to us and has provided us with our own rich and unique expertise in perfume making. This expertise coupled with the various creative ideas and passions of the family members working closely with our perfumer, means that we can strike a good balance between trying new things but with this wealth of experience behind this. With any new fragrance that we are working on, I like to think what if our forefathers were able to smell them and whether they would approve. What should people look for when they are buying a perfume? Perfume is one of the good and often fun things in life and is very much about personal preference. I think that people should look for a fragrance that they feel a connection to in some way and one that suits their mood. Many people choose a different fragrance depending on various things such as, the time of day, the time of year, the weather and also generally what mood they are in. Something that many people use as a guide to finding their perfect fragrance is the compliments that they receive when they are wearing it. Ultimately though I think that if it feels right to you and makes you feel good then you can’t go far wrong. If you could capture in a bottle a particular scent, what would that be? As something that I would not necessarily wear but would love to capture the wonderful smell of the fresh air early on a crisp sunny winter’s morning with just a hint of wood smoke in the background. Did you always intend to work for Floris? 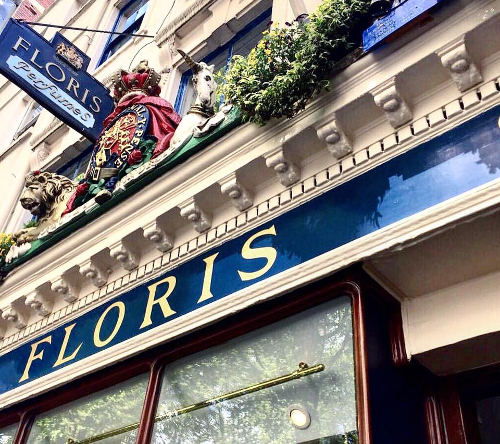 Yes, I have grown up with Floris and have fond memories of visiting my father and grandfather at work as a boy, and working in the shop in my school holidays. I have always felt a strong emotional connection to the fragrances I smelt regularly whilst growing up, along with a real passion for the company. It did always feel like a very natural step to join the family business. Are you loyal to one fragrance or do you like to change often? Do you wear different fragrances in summer and winter, day and night? The fragrance that I am most loyal to would have to be Elite, partly because of growing up with it, as I was five when it was launched. Also though, it’s a scent that every time I smell I am always in awe at actually how good and how complex a fragrance it is. Recently I have been wearing one of our latest new fragrances, Mahon Leather, which is very warm with a gentle spicy note, which I love for these chilly days. Is there any particular item of clothing that you enjoy buying and are very particular about? I’m afraid that I’m not really one for buying clothes. I have my trusty items of clothing so when I do buy I look for fairly simple, but good quality clothing and which I know will become a future trusty item of clothing. Jeans & cords mainly. My wife is very good at knowing what sort of clothes I like so I am lucky enough to be spoilt by her usually at Birthdays and Christmases. Foster & Son shoes on Jermyn Street. Quality and true craftsmanship at its best. On a different note altogether, the Brown Betty. I do love a good pot of tea and I am very pleased with my genuine British-made Brown Betty. Dukes Hotel Bar, St James. Their expert head barman Alessandro makes the most fantastic cocktails including the legendary Vesper, and the new Fleming 89, which was inspired by our No.89 fragrance. Strange, but true. 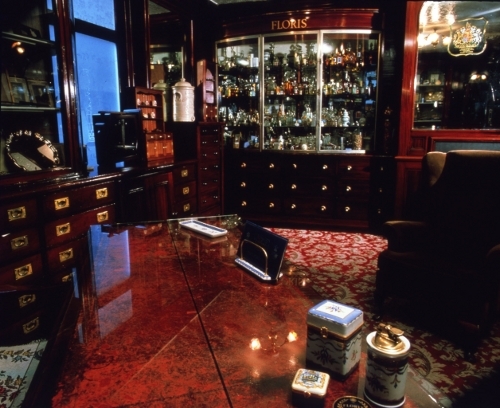 Tweedy's Thought: The interior of the Floris shop in Jermyn Street is an object lesson in leaving well alone. I can think of many heart-breaking examples of shops and pubs where the owners have panicked and thought they needed to chase the latest interior trends, ripping out all the charm and history that had accumulated over the years in the process. Just look at that original mahogany below. Marvellous. So warm and welcoming. Imagine if it was all removed and in came the minimalist look of a bedroom in a ryokan. Shudder. Perfume shows your personality. To raise yourself, applying cologne can be right option. Actually women always like a well smelled man. As a man I always like to apply original branded cologne for men. So be careful to choose the right one.